This week we will be going over a well-known and popular dinosaur, Plateosaurus! Plateosaurus was a plant-eating dinosaur that lived in what is now Germany, Switzerland, Greenland, and France, during the late Triassic Period, between about 214 and 210 million years ago. As an adult it would have averaged about twenty feet long from snout to tail, although certain specimens suggest it was capable of growing even larger than that in some instances. The name, "Plateosaurus" translates to "Broad-Build Lizard" most likely in reference to the dinosaur's robust bones. 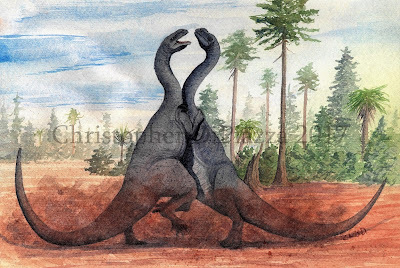 Two rival Plateosaurus engelhardti duel for mating rights by Christopher DiPiazza. The behavior was inspired by the intraspecies combat of many lizards and is purely speculation. Plateosaurus is classified as a basal sauropodomorph, or "prosauropod". These plant-eating dinosaurs were related to the much larger, and more iconic sauropods, like Brontosaurus and Apatosaurus, but tended to live in the late Triassic and early Jurassic periods. In fact, a branch of basal sauropodomorphs actually gave rise to the first true sauropods. Unlike sauropods, prosauropods typically walked on their hind legs. Many of them, including Plateosaurus, were obligatory bipeds, meaning they could only walk on their hind legs, like modern birds, and other theropods. HOWEVER...That being said...Plateosaurus was likely able to walk on all fours when it was a baby, based on what we know about a close relative, Massospondylus, which we know were quadrupedal as babies, thanks to skeletons, then became obligatory bipeds as they grew up. Plateosaurus had a relatively long neck, which it would have used to help it feed on vegetation above and below it without without having to move its body much. It had a long, almost rectangular skull, with the tip of its snout sloping slightly downwards. Within the mouth it possessed many small, leaf-shaped teeth with serrations, which would have been ideal for eating plants, like horsetails, which lived at the same time as it. The back of Plateosaurus' jaws also sloped downwards, implying there was more muscle there for biting through tough vegetation. Plateosaurus mounted skeleton on display at the American Museum of Natural History in New York City. The dinosaur would have likely walked with its tail above the ground in life, as this was mounted before that idea. Plateosaurus also had robust, powerful arms, each tipped with five fingers. 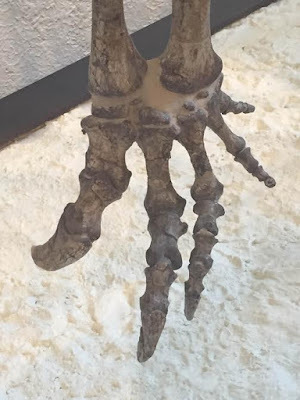 The first three fingers possessed curved claws, the first digit's being the largest. These claws may have helped to manipulate branches while feeding, defend against predators, or fight rivals of the same species. (or all three.) The hind legs were also powerful, each foot ending in four long, broad claws. The long, muscular tail would have helped Plateosaurus keep its balance as it walked around on its hind legs. Left hand of Plateosaurus. Note the large claw on digit 1. Fortunately, Plateosaurus is known from many individual specimens, so scientists have been able to learn a lot about this dinosaur. By looking at certain bones closely, it can be determined how an individual dinosaur was growing. Plateosaurus, it turns out, went through a period of rapid growth when it was young, then slowing down when it reached a certain age or size. However, the sizes of different individual Plateosaurus seemed to vary at the same age. For instance a sixteen-foot long Plateosaurus could have been the same age as an almost thirty foot Plateosaurus. We see this today in modern reptiles and it depends on how many resources are available to animals as they are growing. The more food an animal has, the larger and more rapidly it will grow. 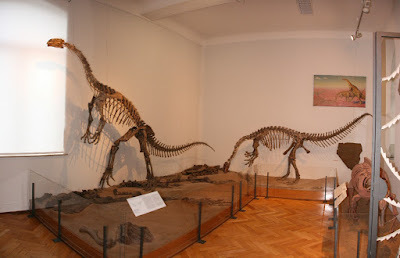 Plateosaurus mounts on display at the University of Tübingen, in Germany. Looking at the mobility of the ribs of Plateosaurus, and how they could change positions depending on if the dinosaur was inhaling or exhaling, it could also be hypothesized that this dinosaur was endothermic, like birds, and would have had the same kind of one-way breathing system that they do. This form of respiratory system, only currently known today in birds and a few reptiles, makes it so that the animal is constantly taking in fresh oxygen with every inhale and exhale. If humans could breathe like that track events would be a lot more intense! That is all for this week! Special thanks to Dr. Heinrich Mallison, who lent his expertise on Plateosaurus for the making of this post. Creisler, Ben. "Plateosaurus: The Etymology and Meaning of a Name." Plateosaurus: The Etymology and Meaning of a Name. Dinosaur Mailing List, n.d. Web. Huene, F. von (1926). "Vollständige Osteologie eines Plateosauriden aus dem schwäbischen Keuper" [Complete osteology of a plateosaurid from the Swabian Keuper]. Geologische und Paläontologische Abhandlungen, Neue Folge (in German). 15 (2): 139–179. Jaekel, O. (1911). Die Wirbeltiere. Eine Übersicht über die fossilen und lebenden Formen [The Vertebrates. An overview of the fossil and extant forms] (in German). Berlin: Borntraeger. Mallison, H. (2010). "The digital Plateosaurus II: an assessment of the range of motion of the limbs and vertebral column and of previous reconstructions using a digital skeletal mount". Acta Palaeontologica Polonica. 55 (3): 433–458. Sander, M.; Klein, N. (2005). "Developmental plasticity in the life history of a prosauropod dinosaur". Science. 310 (5755): 1800–1802. Bibcode:2005Sci...310.1800S.